Bikers, rollerbladers and joggers know that there are few better places to enjoy those activities than on the Vancouver seawall. From the edge of Coal Harbour to Kitsilano, the seawall covers 22 km. But it wasn’t constructed for pleasurable purposes, in 1914; the seawall was made to prevent the shore’s erosion. James “Jimmy” Cunningham, a master stonemason, spent 32 years constructing and advancing a large portion of the seawall. Despite becoming ill, he continued to supervise the progress into his very last day in 1963. His ashes were scattered around the North Western point of Stanley Park, near the Siwash Rock where a commemorative plaque can still be found. The seawall has been through a lot of harsh conditions over the years, which threatened its preservation. During World War I, a storm caused flooding from the shores near Second Beach to the Lost Lagoon. More recent storms have also caused closure to the seawall; including 2006, when a windstorm devastated 60 per cent of the Western forest causing fallen trees and landslides onto the pathway; and in December 2012, flooding forced debris onto the seawall, damaging a small portion. As popular as the seawall is now, there was a time when cycling was forbidden. Because of frequent collisions on the narrow path, only those on foot were permitted. 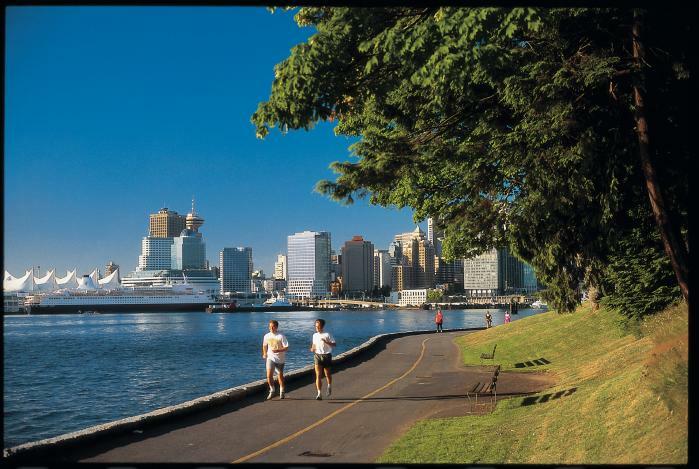 In 1977, a proposition was made to widen the seawall, creating both a pedestrian lane and a biking/ rollerblading lane. But the proposal was met with environmental backlashes, which led to an issue that took seven years to resolve. Although the expansion resulted in less accident, many still tried to ban cycling on the seawall. Eventually, a survey in 1992 showed that the majority appreciated the opportunity to ride their bike around the edge of the Pacific Ocean. So the ban was not reintroduced, and now all are free to choose their method of journey. Locals and visitors will agree that the seawall is an irreplaceable part of the city’s landscape. Vancouver is often described as a beautiful place, and those that have seen it, will know that the most presentable side of the city is along the seawall.